Summary: Review the DNS considerations in this topic before implementing Skype for Business Server. 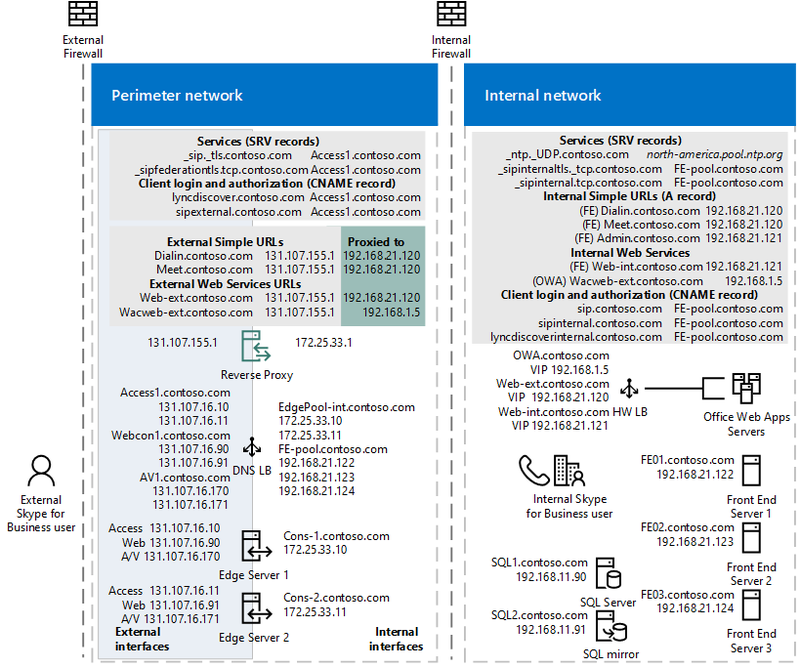 This article only addresses DNS planning for Skype for Business Server deployments on an organization's on-premise network. For Skype for Business Online refer to "Office 365 URLs and IP address ranges" at https://aka.ms/o365ips. A Domain name service (DNS) server maps hostnames (like www.contoso.com, presumably a web server) to IP addresses (such as 10.10.10.10). It helps clients and interdependent servers communicate with each other on the network. When you set up an implementation of Skype for Business Server 2015 you'll need to make sure the mapping of new server names (usually reflecting the role they'll be taking on) matches the IP addresses they are assigned to. When you are installing a new implementation as described in Create DNS records for Skype for Business Server and building your topology for Skype for Business Server, we recognize that you can choose to use the DNS capabilities built in to Windows Server 2016 or a third-party DNS package, so we'll keep the discussions in this article general rather than specific. We're detailing what's needed, and how you meet that need is your decision to make. The following tables show DNS records Skype for Business Server uses to provide services to users. Some are optional in that they are only needed to support certain features, and they can be skipped if those features are not desired. The DNS records needed for internal access only are in the first table, and a deployment allowing internal and external access will need records from both tables. DNS LB to 192.168.21.122 192.168.21.123 192.168.21.124 DNS Load Balancing of Front End Pools. Maps the Front End pool name to a set of IP addresses. 68.123.56.90 Required to enable client to server web traffic, such as downloading the Skype for Business Web App. Required if mobile clients will resolve DNS internally. Can resolve to DMZ Reverse Proxy IP or Internet IP. A Director can authenticate a user and is optional. A/AAAA Persistent Chat Server FQDN Persistent Chat Server IP address A Persistent Chat server is required for the Persistent Chat feature and is otherwise optional. 192.168.21.121 Internal AutoDiscover Service1, required for Mobility support. If internal DNS is used to resolve for mobile devices, it should point to the external IP, or DMZ VIP. You can implement this as a CNAME instead of an A record if desired. north-america.pool.ntp.org NTP source required for Lync Phone Edition devices This is required to support desktop handsets. If you are using DNS load balancing on this pool, your Front End pool and internal web farm cannot have the same FQDN. ❶ Used by a client to discover the Front End Server or Front End pool, and be authenticated and signed in as a user. More detail on this is in Walkthrough of Skype for Business clients locating services. ❷ This is only required to support legacy clients prior to Lync 2013, and desktop handsets. ❸ In the situation where a Unified Communications device is turned on, but a user has never logged into the device, the A record allows the device to discover the server hosting Device Update Web service and obtain updates. Otherwise, devices obtain the server information though in-band provisioning the first time a user logs in. Not available in Skype for Business Server 2019. ❶ Required to deploy Federation, otherwise optional. ❷ Used by a client to discover the front end server or Front End pool, and be authenticated and signed in as a user. ❸ This requirement applies only to clients on Apple or Microsoft based mobile devices. Android and Nokia Symbian devices do not use push notification. For more detail on Edge Servers and perimeter networks, see the Edge server DNS planning content. Skype for Business Server supports the use of IPv6 addressing. See Plan for IPv6 in Skype for Business for more details. For more detail on FQDNs, see DNS basics. Split brain DNS is a DNS configuration where you have two DNS zones with the same namespace. The first DNS zone handles internal requests, while the second DNS zone handles external requests, as mentioned in these tables. For more about this see Split-brain DNS. If you plan to have some users homed online and some homed on premises, refer to the Hybrid connectivity planning article Skype for Business server 2019. You will need to configure DNS as normal for Skype for Business Server 2015 and also add additional DNS records. You should also refer to "Office 365 URLs and IP address ranges" at https://aka.ms/o365ips to confirm that your users will have access to the online resources they will need. A Uniform Resource Locator (URL) is a reference to a web resource that specifies its location on a computer network and a protocol used to retrieve it. Meet is used as the base URL for all conferences in the site. An example of a Meet simple URL is https://meet.contoso.com. A URL for a particular meeting might be https://meet.contoso.com/username/7322994. With the Meet simple URL, links to join meetings are easy to comprehend and easy to communicate. Dial-in enables access to the Dial-in Conferencing Settings web page. This page displays conference dial-in numbers with their available languages, assigned conference information (that is, for meetings that do not need to be scheduled), and in-conference DTMF controls, and supports management of personal identification number (PIN) and assigned conferencing information. The Dial-in simple URL is included in all meeting invitations so that users who want to dial in to the meeting can access the necessary phone number and PIN information. An example of the Dial-in simple URL is https://dialin.contoso.com. Admin enables quick access to the Skype for Business Server Control Panel. From any computer within your organization's firewalls, an admin can open the Skype for Business Server Control Panel by typing the Admin simple URL into a browser. The Admin simple URL is internal to your organization. An example of the Admin simple URL is https://admin.contoso.com. Simple URLs are discussed in more detail at DNS requirements for simple URLs in Skype for Business Server. You can set the names of these pools and servers as you wish, but make them memorable and reflect their function in the system. Persistent Chat, Director, Mediation Server, Front end server An internal A record that resolves the fully qualified domain name (FQDN) of the server to its IP address. Persistent Chat, Director, Edge Server, Mediation Server, Front end An internal A record that resolves the fully qualified domain name (FQDN) of each server node in the pool to its IP address. Multiple internal A records that resolve the fully qualified domain name (FQDN) of the pool to the IP addresses of the server nodes in the pool.